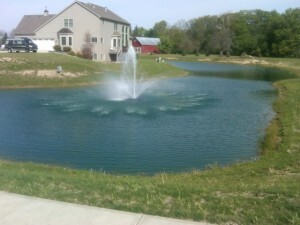 Cloudy pond water is an issue that can really frustrate the most diligent pond owners. Cloudy water makes it hard to see your fish or enjoy the clear, pristine water that we all dream of. If the water in your pond is cloudy with a greenish tint, then there’s a very good chance what you’re looking at is microscopic-planktonic algae. Ponds with a microscopic-planktonic algae issue can vary in color and in the density of the cloudiness. We’ve seen everything from a light, almost pleasing greenish tint to a thick pea soup like consistency that’s not pleasant at all. Adding pond dye (Blue, Bahama, or Black) – this is a great option since many ponds that have consistent green water issues also get a great deal of sun exposure through the day. By adding dye, the sun exposure is limited. Introducing certain plants can also be helpful. When plants are used in combination with bacteria, a pond owner can often cover 1/4 of the pond’s surface with plants and get good results. Installing an aeration system – this will introduce dissolved oxygen to the water column. It’s important to get a system that’s adequate for your pond size and volume and be sure to circulate the water through at the recommended rates to get the best results. Combining liquid Algae control with copper sulfate – this works incredibly well in extremely large ponds because the liquid Algae has Stabitrol technology. Sea 7’s Stabitrol can keep copper suspended in solution for weeks at a time in an ultra low PPM, offering safety AND the ability to work effectively on multi-acre ponds with ease. If your pond is milky-grey and stocked with fish, you’ll want to test ammonia and nitrate levels right away. Many times you’ll see a drop in clarity as these readings rise and consequently, as they are lowered the cloudiness will improve as well. Obviously for the sake of the fish, you’ll also want to bring these issues in line as quickly as possible as well. New ponds and those being restarted in the spring can show cloudy water for a short time as the bacteria levels are building up. Sometimes even an overabundance of rain and wash-in can create this phenomenon for a short time but this will usually clear up on its own after a few weeks. If you find the cloudy water to be brown or “tea colored” in appearance, this type of issue could be coming from simple dirt in the water or something like suspended organic sediments that have built up in the pond. Organic sedimentation can come from uneaten fish food, decomposing matter like leaf debris and other natural sources. You can solve this problem quickly by utilizing one of the Blue or Black pond dyes with Suspend technology. These dyes are unique in that that they will trap (crap on to) charged particles and work to drop them from the water column. This can be very rewarding as well as the color can really dramatically improve. You can improve the clarity of the water in this case by increasing your aeration- filtration systems in various ways – or there are additives such as alum or montmorillonite clay that can bind to these particles in the water and pull them down to the bottom of the pond. Over time this sediment (if it’s organic in nature) can be broken down by the use of beneficial bacteria. The Bio pond cleaner will prove very safe and effective. Sea 7’s key technology, BioStart Complex, insures rapid colonization and safeguards bacteria early in application process. Every pond is different but have many similarities. The pond problems noted above are some of the more common issues related to water clarity and cloudy water. If you’re able to identify what type of issue you’re dealing with, you can then begin to apply the various methods to re-balance the pond or begin work to treat the root cause of the problem.